1. Pay on time. This counts for 35% of your score. Even paying the minimum amount counts. All of my bills are set up to automatically get paid when they are due. Not sure if you’ll have enough money in your account to cover your bills? At least have the minimum amount deducted so you can help your credit score, and your future. 2. Manage your debt-credit limit ratio. Does that sound scary? Someone once told me it did. This accounts for about 30% of your score. It’s actually simple. It’s your debt (your combined balances from all of the things you owe including credit cards, loans, etc.) compared to your credit limit. Your credit limit is the combined total of the maximum amount each credit card is willing to let you charge. For example: You have two credit cards. One of them allows you a $5,000 credit line. You currently owe $1,000 on it. You have another card where you have a $10,000 credit line in which you owe $6,500. Your total debt is $7,500 ($1,000 from card #1 and $6,500 from card #2). The total credit available is $15,000 ($7,500/$15,000). This means that your debt-to-credit ratio is 50%. Yikes, that’s pretty high. The lower the better, of course. 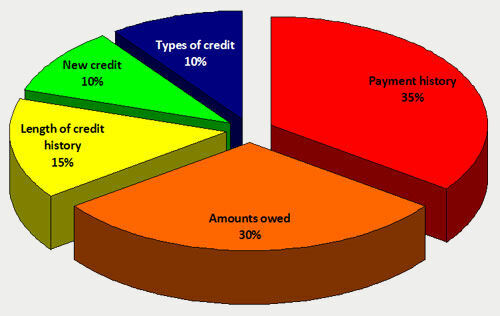 3. CREDIT HISTORY. They’re talking about how long of a credit history you have. Don’t automatically cancel cards that you dont want anymore. If you’ve had them forever, and have a good paying history with them, think about shredding the card and keeping the account open for you credit. It helps show your payment history by giving people a snapshot of your past money management habits working with you. You’ll want to protect that credit history that you have, so if you’re canceling cards, always do the cards that are newest first. If you wake up one Sunday morning feeling great, and decide to quit shopping, dont cut your cards all at once! Congratulations to you too by the way for quitting shopping. It will effect your score by cutting the umbilical cord on all of them at the same time, so try spacing them out. A month or two in between for each should be enough time to not make too much damage. You can watch your credit report/score while you do this to be sure. This, by the way, is about 15% of your score.